Well that didn't last long, now did it? The Droid RAZR has just been released, and it's already rooted using the widely spread zergRush exploit and DooMLoRD's easy rooting toolkit. 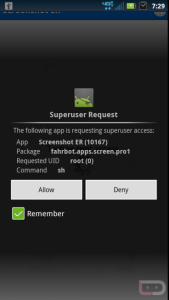 A superphone doesn't suffice without superuser permissions, now, does it? Of course, there's an omnipresent risk with rooting - which, unfortunately is the case here too. If you don't know what rooting does to your phone or don't need it, I suggest you leave this page, as there's no unbricking method yet. However, if you're one of the daredevils who loves risk, read the full instructions below the usual disclaimer. As usual, Androidguys nor DooMLoRD nor the creators of zergRush take responsibility for what you do to your phone. This means that if your phone suddenly starts ringing your doorbell, it's not our responsibility. Download and install the drivers for your phone, this only works for Windows. 32-bit or 64-bit. Download the rooting package here and extract it. Go to Settings > Applications > Development and enable USB Debugging. Connect your Droid RAZR to your computer and select 'Charge only' from the notifications bar. Wait a few moments, your phone should now be rooted. For the Linux instructions, read this and for the OS X instructions you can check out this page. Retail Motorola Droid RAZR rooted: Windows, Linux and OS X instructions included originally appeared on AndroidGuys.